In this paper we explore the issue of transforming models to models, an essential part of the OMG’s Model Driven Architecture (MDA) vision. 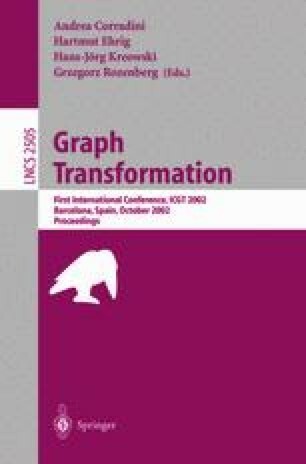 Drawing from the literature and our experiences implementing a number of transformations using different technologies, we explore the strengths and weaknesses of the different technologies and identify requirements for a transformation language for performing the kind of model-to-model transformations required to realise the MDA vision. DSTC. Breeze: Workflow with ease, online documentation. http://www.dstc.edu.au/Research/Projects/Pegamento/Breeze/breeze.html. DSTC. dMOF: an OMG Meta-Object Facility Implementation. http://www.dstc.edu.au/Products/CORBA/MOF/index.html. DSTC. TokTok-The Language Generator. http://www.dstc.edu.au/Research/Proj ects/Pegamento/TokTok/index.html. S. Gyapay and D. Varró. Automatic Algorithm Generation for Visual Control Structures. Technical report, Dept. of Measurement and Information Systems, Budapest University of Technology and Economics, Dec. 2000. http://www.inf.mit.bme.hu/FTSRG/Publications/TR-12-2000.pdf. E. Koutsofios and S. North. Drawing graphs with dot. http://www.research.att.com/sw/tools/graphviz/dotguide.pdf, Feb. 2002. S. Thatte. XLANG Web Services for Business Process Design. Microsoft: http://www.gotdotnet.com/team/xmlwsspecs/xlang-c/default.htm, 2001. W3C. XSL Transformations (XSLT) v1.0. W3C Recommendation: http://www.w3.org/TR/xslt, Nov. 1999.